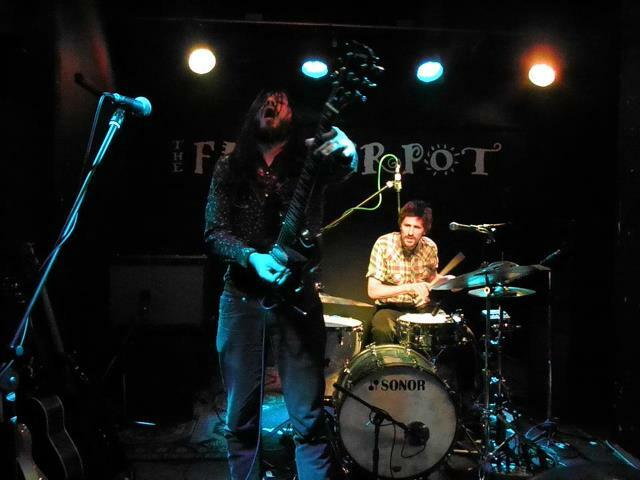 The Flowerpot gig was the first night of Marcus Bonfanti’s current UK tour in support of his soon to be released third album Shake The Walls. The Marcus Bonfanti Band hit the stage with the stunning Don’t Stone Me Sober before launching into Going Down and the sublime Jezebel. There were a lot of new tracks played tonight from the new album including lead single Cheap Whisky complete with one of the best solos Bonfanti has ever played, Blind Alley, We All Do Bad Sometimes, Alley Cat and Electric Lady (Back Of A Car), if any of these tracks are anything to go by, the new CD is going to be superb. Throughout the night Bonfanti kept plugging his new album, which he is clearly very proud. Marcus regaled the audience with some humorous anecdotes and stories behind some of the songs in between numbers. The set ended with powerful versions of Honey and My Baby Don’t Dance. The crowd were absolutely ecstatic and shouted for more. As is now customary, Bonfanti returned to the stage on his own and played a haunting rendition of his classic Bittersweet before being joined by his band for the final song of the night, an absolutely incendiary version of Gimme Your Cash and another stunning guitar solo. If Bonfanti carries on playing this well he will soon have a richly deserved Guitar Hero status. The Marcus Bonfanti Band completed by Scott Wiber on Bass guitar and Alex Reeves on Drums are incredibly talented and are great value for money. Bonfanti et al get better with every gig they play; it is only a matter of time before they will be filling much larger venues. Shake The Walls can be pre-ordered now on Amazon and is released on 17 June 2013.